If you are wondering how to properly water air plants, you are not alone. 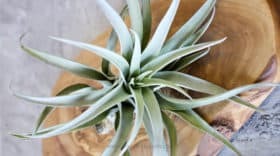 There are a lot of misconceptions about watering air plants. This is unfortunate because these false ideas have led to many premature air plant deaths and disenchanted air plant enthusiasts. Happily, for you and your air plants, this post will show you that watering air plants is really quite easy. Show You Know: Be sure to take the quick quiz at the end of the post. One common myth is that air plants will get all the water they need from the air. While they do absorb water in the air, air plants need more water than is available through the humidity in the air. This was the false information that my sister, who first introduced me to air plants, was given. My sister placed her air plant in a teardrop terrarium she had admired its unusual, yet pleasing form. She assumed all was well and that the air plant was sufficiently hydrated enjoying the humid, coastal climate where she lived. One day she reached her hand into the terrarium and the air plant crumbled. 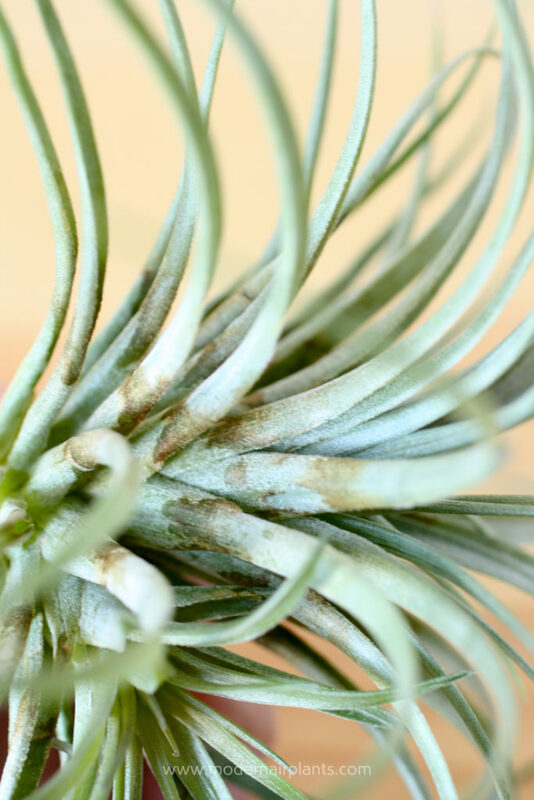 Make no mistake, an unwatered, neglected air plant is a dehydrated air plant. On the other extreme, just yesterday I was given an air plant from a family friend. After her air plant finished blooming she generously gave me her air plant to add to my collection. She knows that I can never have too many. She received her air plant as part of a class at a local nursery. The instructor, the owner of the nursery, showed everyone how to wrap the end of the air plant in sphagnum moss. To keep the air plant hydrated the class members were told to soak the plant with the moss in water once a week. The nursery owner mistakenly believed that the air plant would benefit from the added humidity that the damp moss would provide. Instead, it created an environment for rot. Be sure to set air plants on dry medium, such as dry rocks. If the air plants are in a terrarium, the plants will do best if it is a dry, not a wet terrarium. A terrarium with a wide opening allows for maximum ventilation. To care for air plants never set them on any medium that is wet, or even damp. All rocks, mosses, branches etc. that you use to display your air plants should be totally dry. Like us, air plants don’t want a wet bed. Many people wonder: How do air plants absorb water and nutrients? Unlike like most plants, it is not through their roots. Instead, air plants absorb water and nutrients through their trichomes, the silvery sheen or sometimes hairlike substance on the leaves. Trichomes are like tiny sponges that absorb water for the plant, like roots do on other plants. Trichomes give this tillandsia caput-medusae a silvery sheen. 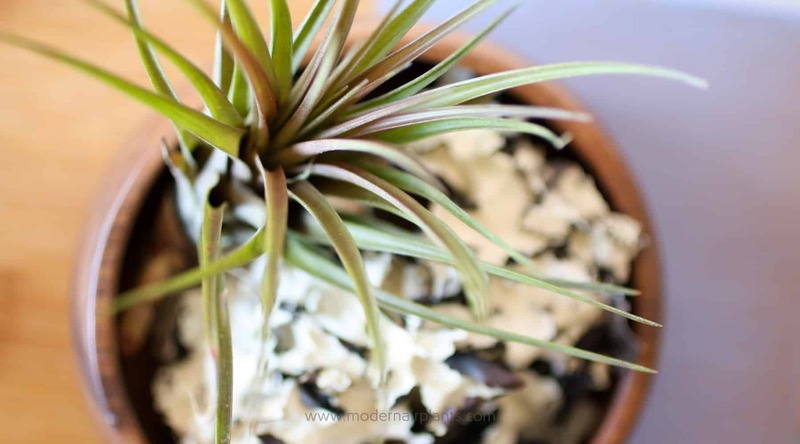 Tip: An air plants roots only function is to help them cling, harmlessly, to their host. These roots can be trimmed off without any harm to the plants. Over time, the roots will begin to grow again and can be trimmed off right at the base of the plant. 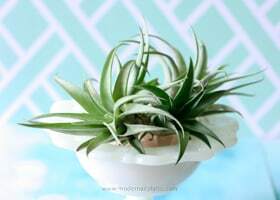 When watering your air plants never use soft or distilled water. Tepid tap water will work, but rain water or pond water is ideal. I’m pretty fortunate in this regard, in exchange for a couple of tic-tac candies my son happily fills a bucket of water from the creek behind our house to water our air plants. 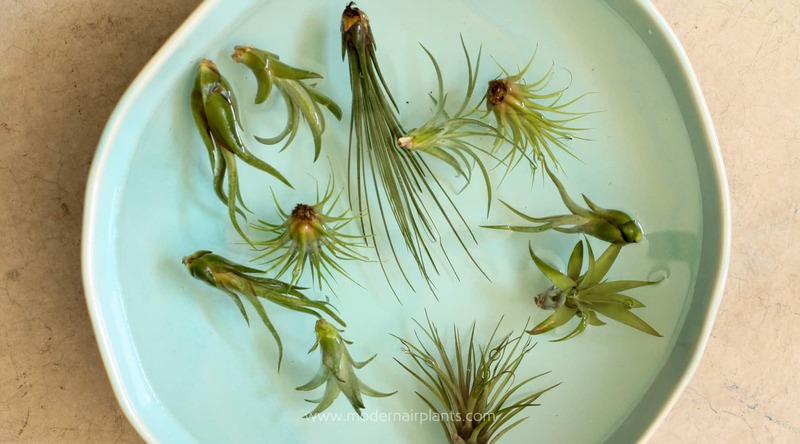 Tip: I collect and re-use the rain and pond water I use for soaking my air plants. After a while, the water starts to smell. The more organic material is in the water, the more quickly the water will smell. After several weeks I dump the water on my roses and begin again. If you’re ready to get technical, air plants prefer their water with a pH between 5.5 and 6.0. It can be tricky getting the pH just right, so don’t give up if you have a hard time. To get an accurate reading, carefully follow the manufacturer’s instructions. Two household products can be used to adjust the pH of your water: vinegar and baking soda. If your water is too acidic, less than 5.5, add a small amount of baking soda. If your water is to alkaline, higher than 6.0 add a small amount of vinegar. After making pH adjustments, wait until the next day to test the water. This will help you to get an accurate reading. In the meantime, if you need to water your air plants and the water isn’t ready, use tap water. From experience I can tell you to only add a little vinegar, or a little baking soda. I’ve way overdone it and had to start over. But, I learned, and eventually, I got it. Now, you know another reason I hang on to my rain and pond water. After fiddling with the pH, the water becomes even more precious. After getting the pH where you want it, re-test it every so often. 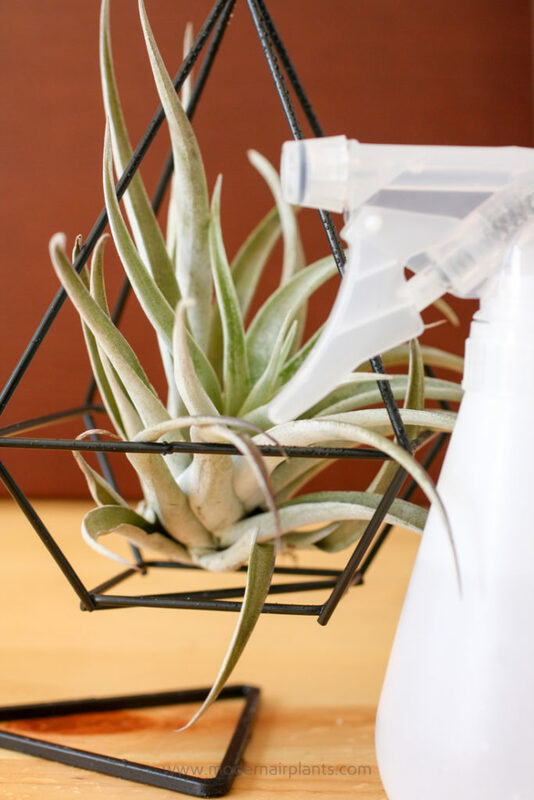 Air plants benefit from periodic spritzing with a spray bottle. 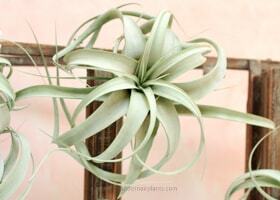 Especially if you live in an arid climate your air plants will appreciate a refreshing mist. 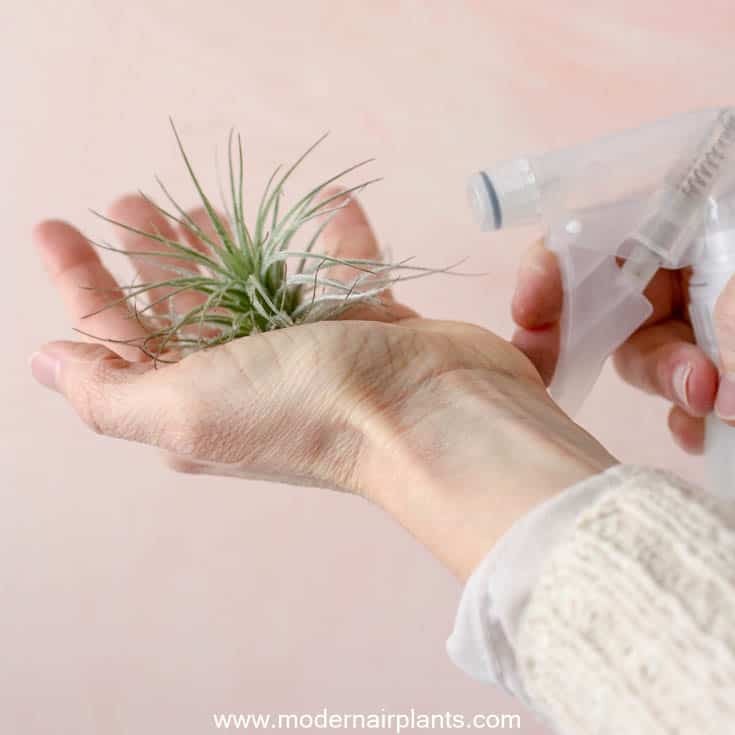 Keep in mind that this method should never be the sole means of watering your air plants. The trichomes will not be able to absorb all the water they need through misting alone. Ready. Aim. Fire. This tillandsia capitata benefits from periodic misting. Although misting is not sufficient for watering most air plants, there is one notable exception: the Tillandsia tectorum. This air plant comes from high in the Andes mountains where these plants are uniquely adapted to their harsh environment. Their fuzzy appearance is due to a profusion of trichomes that shield them from the direct light of the sun. Additionally, the trichomes make the most of what little moisture is available. To water a T. tectorum, thoroughly mist it once a week to once every three weeks, depending on your climate. Never dunk or soak a T. tectorum. If you are in a hurry and you know your air plants are thirsty, giving them a quick dunk will get them through the day until you can give them a proper drink. 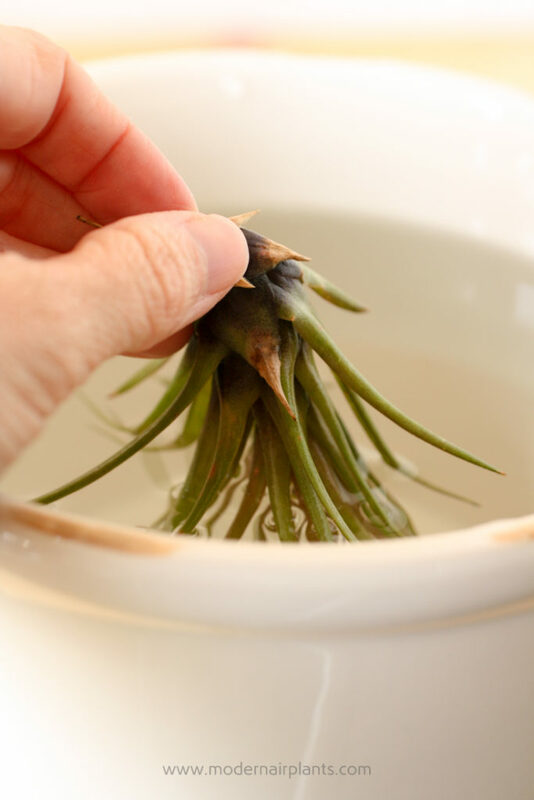 To dunk an air plant, quickly submerge the plant in water, once or several times. Alternatively, hold the plant under the faucet at the sink. 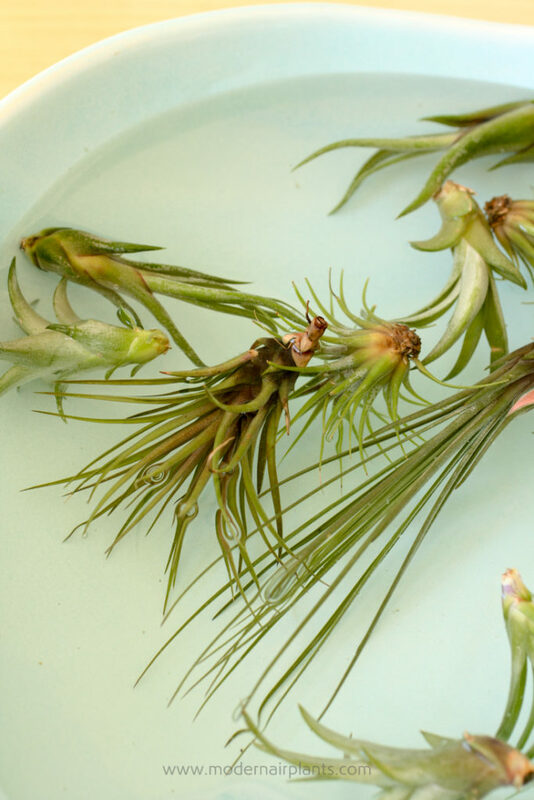 To dunk air plants, quickly and completely submerge the plants in water. This T. tricolor v melanocrater enjoys a quick dip. To really hydrate an air plant there is nothing like a thorough soaking. This can be accomplished by filling a bowl with tepid water deep enough to accommodate the entire plant. If you have a lot of air plants you could use a sink or even a tub. How often do you water an air plant? About once a week, let your air plants soak in a water bath for about an hour. Be sure to adjust this schedule according to your climate. If it is really humid where you live, 20 minutes may be all your plants need. In dry climates, soaking up to 4 hours may be required. 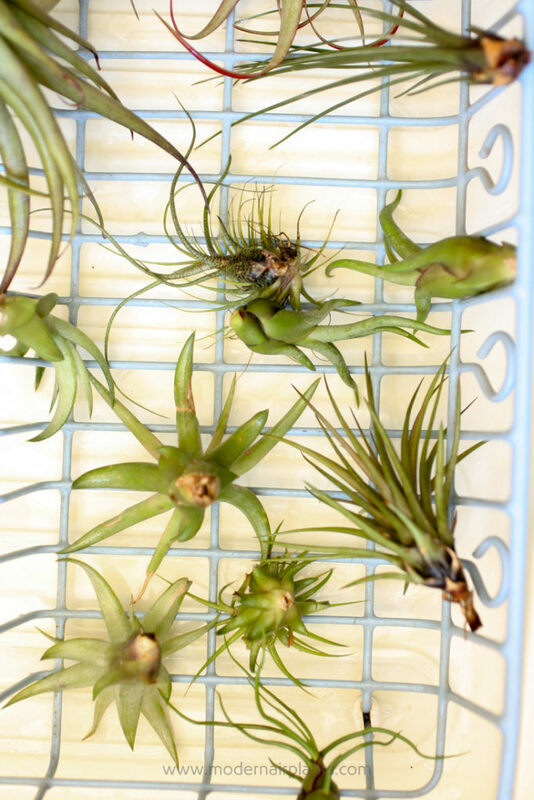 A water bath is the most thorough way to water air plants. An air plant that has been glued to a display can be a little tricky, but i’ts definitely possible. Rather than submerging the entire arrangement into a basin of water, use the your faucet. Keeping the wood, or whatever the air plant is glued to, out of the water, hold the air plant under a light flow of tepid water. Let the water run over the plant for several minutes. 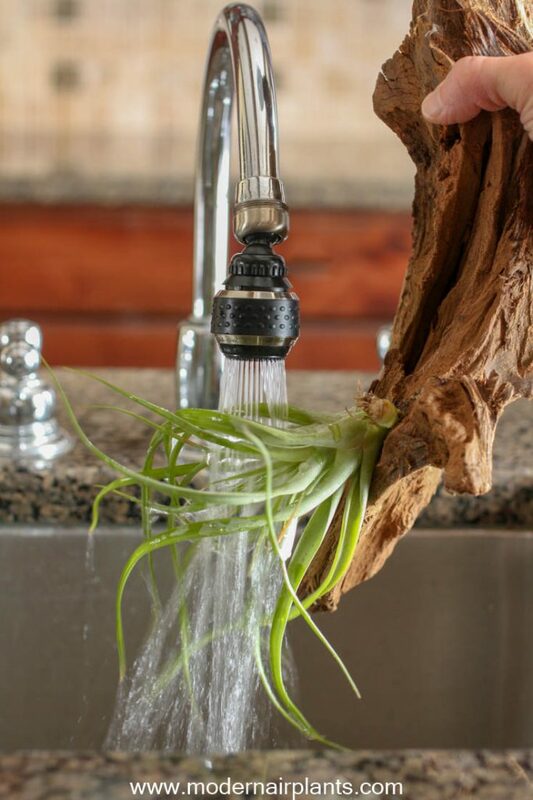 Trying to keep the driftwood dry, hold the air plant under the faucet under tepid water for several minutes. Pictured above is a T. abdita glued to driftwood. After watering hold the display so that excess water will run away from the plant and won’t pool inside the plant. If the air plants are not glued to the display and can be easily removed. 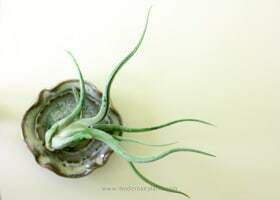 Take them out of the arrangement and water them as you would any other air plant, by soaking the plant in a basin of water. To ensure a long and healthy life for your air plants allow them to dry properly. After watering your plants let then rest on their side for about 4 hours with plenty of air circulation. This method for drying will prevent water from accumulating down inside the plant and rotting it. After 4 hours return the plants to their display. The importance of allowing your plants to drain and dry cannot be overstated. To dry air plants set them on their side, or up-side-down to allow excess water to drain away from the plant. You could use a towel, a colander, or a dish drying rack for the purpose. Going on vacation? No problem. Your air plants will survive without you. Just before hitting the road, soak your air plants for 12 hours. When you come home, soak them again for another 12 hours. This method is ideal for a 2 week vacation. Any longer than that you will need to recruit a neighbor or friend to help you out. Now you know how to properly water your air plants. Your air plants will not crumble in your hand with dehydration, nor will your air plants rot with over accumulated moisture. You’ve got this! Soak and dry. That’s it! I have hard water. Does that mean I can use water from my faucet? Thanks! Thank you for your thoughtful question. I have hard water too and my air plants are thriving. Hard water means that you have a high mineral content in your water. Soft water, on the other hand, has no minerals- and air plants don’t like that. Hi Anna, Can I use filter water to soak the plants? Filtered water is fine for watering air plants, especially as filtration removes chlorine. Just be sure to stay away from soft water and distilled water. Thank you for the great info! I have killed air plants by rot and now I’m nervous!🙄 I was soaking twice weekly because it gets very dry during the winter. Can soaking too often cause rot, or is dry time the most important? Is there a way to tell if the air plant is dry enough? Great question! 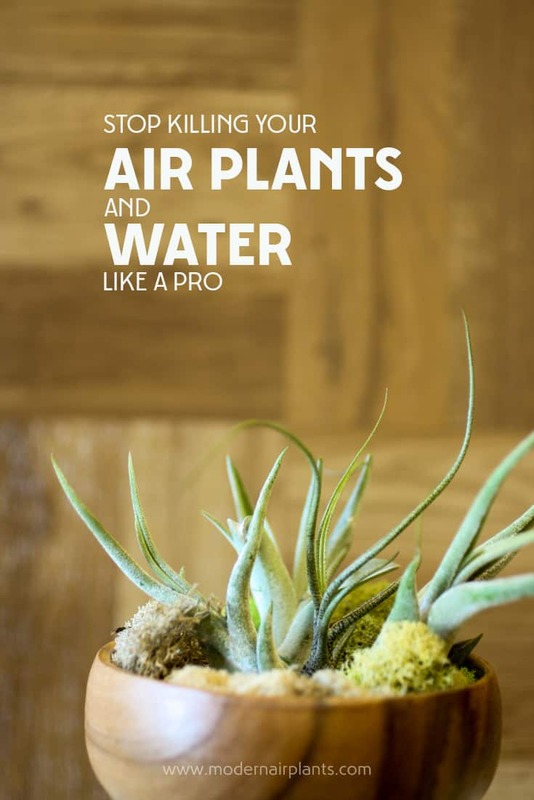 This is what I do during the winter months – I get really dry air as well: I use a humidifier, then I soak my air plants every 7-10 days. The air is cooler, so they don’t need to be watered as often. It sounds counter-intuitive, but the humidifier keeps them from drying out too much. Yes, your air plants do tell you when they need water. Notice how the leaves look when they are well-hydrated. When the plants begin to dry out, the leaves will begin to curl in. My husband put way too much water in my plant and I am afraid he killed it. Would you have any suggestions for fast drying or any advice for my poor plant. I am afraid that he filled the bottom of its terranium and it sat for at least 5 days. 🤦‍♀️😳😔 The plant itself is all soft and it wasn’t before this incident. Just place the air plant where it can get lots of air circulation – out in the open, not in a closed container. 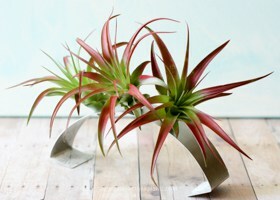 Set the air plant up-side-down so that any residual water can drain away from the cup of the plant. Let me know how it goes. My air plant looks a bit dry. It has gotten smaller and more compact. Can I still rejuvenate it by soaking? Yes, soaking your air plant is exactly what you need to do. After soaking your air plant is it crucial to let the air plant dry up-side-down to avoid water accumulating inside. My air plant looks like the one in the picture above the Trichomes header. What causes the actually leaf to turn brown? The center and baseblook healthy and even the inner leaves. It’s only the outter ones that turned. The picture of the air plant with the brown marks you are referring to are caused by water marks. To answer your question, it is constant moisture, without a chance to dry out that has caused the brown marks. While the marks do fade, they will not ever completely go away. Over time outer leaves do fade and wither and can be either gently torn off or trimmed off with scissors. Anna, thanks for your answers! Anna, thank you for your answers! if I soak Tillandsia, and she begins to form a flower spike. Can soaking damage the peduncle? And how to deal with soaking in such cases? Yes, soaking can damage the flower. Just do the best you can to protect the flower when watering. When an air plant is in flower you could run water over the plant, while shielding the flower with your hand. Even if the flower is damaged, a pup should still form. 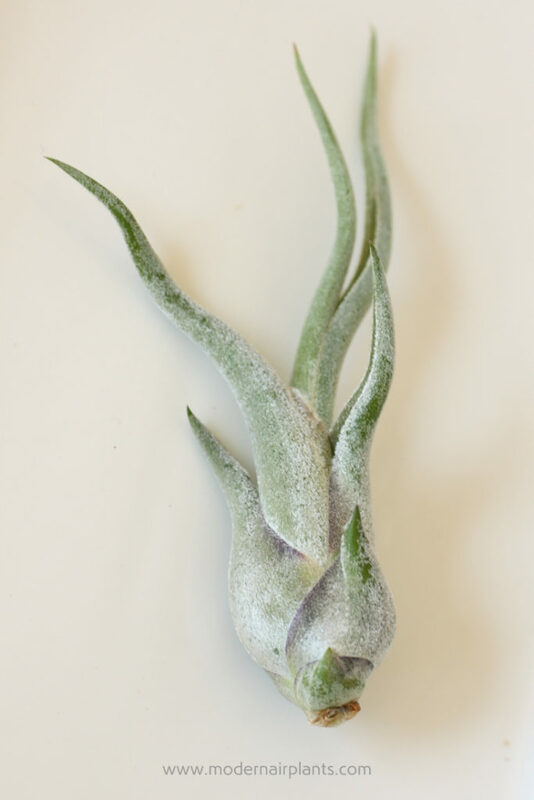 I bought a Tillandsia Tectorum in the online store, she will soon come to me. How can I water this Tillandsia if the humidity is over 80% in my apartment? The Tectorum is the one air plant that you should not soak. Just mist it once a week, maybe every other week since the humidity in your apartment is so high. Tectorums are fun air plants! I will try not to spray Tillandsia at all, I will only soak them for 1 hour, once a week and see how they react to this regime. Tell me, please, if the air humidity is usually more than 80% in my apartment, is it enough to spray my Tillandsias once a day and soak it once a week? Or maybe they do not need to be sprayed at all? I think you are right, you can skip spraying them, and just soak them once a week. You say to let the tap water to air out,but I live in Antioch,Ca. They use chloramine I’m told that it doesn’t dissipate out of the tap water. If your tap water isn’t suitable, you can use (and reuse) bottled water. Just be sure not to use soft or distilled water. I am enjoying your tips. I have been told that after your plant has pups it will die. I have one plant that has had 2 pups and it is still doing well. I separated the pups and they are surviving. I was also told that after flowering they die. Is this true? I have a gold fish pond and they are always having babies now my Tillies.. I guess my home is fertile. Lol. It is true that after an air plant flowers (air plants flower only once) and has pups that it will eventually die. This doesn’t mean that it will die tomorrow though. The air plant could still have lots of time left. I have an air plant that has fuzzy white fur and is drying up. Every time I spray it it gets worse. What should I do? Thanks for reaching out to me. By your description I am guessing that you’re growing a Tillandsia Tectorum. First, a little background on this fuzzy air plant: The T. tectorum is native to Peru, in the Andes mountains where it is high and dry. What little water they receive is from cloud condensation. These plants need very little water and lots of sun. My guess is that you are over-watering your plant. Spritzing it once a week to once every three weeks (depending on your climate) will give the T. tectorum all the water it needs. Thanks for quick reply…………On of my gifts for my granddaughter for Christmas is an air plant……….We are going on a play date to outfit it’s terrarium and pick out plants…………..I am also doing a small one for myself………Your site has given me the confidence to go ahead with this project………..This will be a great sharing and fun experience with her………….Thanks again……..
Great question! Yes. Tap water is fine. If you’re tight on time, you can use regular tap water. That’s better than not watering. But, if you’ve plan ahead and let the water sit before using that’s even better. Brilliant! I’m SUCH a bad plant parent, this really helps, thanks!! Thanks Emily! I appreciate your comment!